Sometimes it doesn’t. Hummus and pesto are two major bugbears of mine, both such staple ingredients (in certain middle class sections of society anyway), perennially popular yet tasting of little more than the cheap, bland ingredients from which they are made (sunflower oil and cashews instead of olive oil and pine nuts? Yes, Sacla, I’m looking at you). Fresh pasta is another pet peeve, marketed as superior and sophisticated in its dedicated section of the supermarket, while the reality when you peel open the plastic packaging is anything but. Dry, claggy and lacking in any of the personality that a plate of pasta should deliver, shop-bought pasta is something I’ve been boycotting for a while. But now, as the proud owner of a brand new pasta machine, it’s an issue I can address head on. 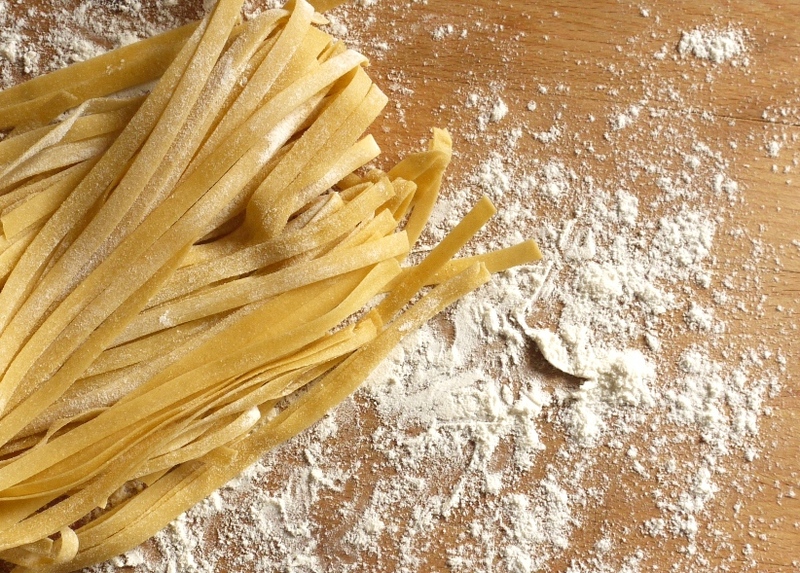 The first time I made my own pasta was at my parents’ house in Italy. I must have been about seven years old and armed with little more than an oversized apron, a giant rolling pin (which at a metre long was almost as big as I was), a bag of flour and a basket of eggs. Oh, and an Italian nonna, forearms muscled from years of pasta-making practice and purveyor of the aforementioned yellow-yolked eggs. My older brother had expressed an interest in learning how to make pasta (he was definitely the superior talent out of the two of us when it came to all things savoury, my love of baking ingrained from an early age). Ever happy to spread the joy of Italian cooking, our neighbour, all giant smiles and jet-black hair (which remains so to this day, twenty odd years later and nudging into her eighties) – headed over to teach us what she knew. 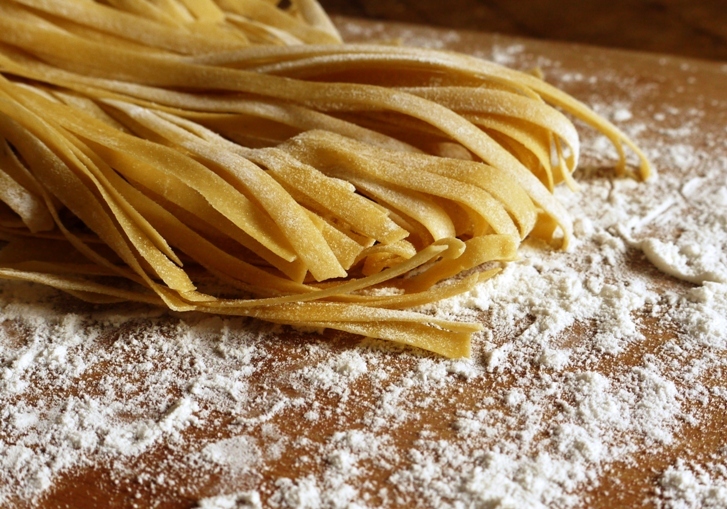 Making pasta by hand isn’t impossible, but it’s definitely a labour of love. Rolling the dough out to the requisite thickness requires time and patience, as well as an enormous flat surface, something our little London flat simply doesn’t have. So while a bad workman may blame their tools – or lack of them – a good (or even mediocre one) should definitely give thanks and I was extremely thankful to receive a pasta machine for Christmas. This weekend I put it into practice for the very first time. The recipe below uses what seems like a slightly insane number of eggs. But like those ice cream recipes that require enormous amounts of egg yolk for the custard, they do produce the most incredible colour and texture. It’s silky and yellow without tasting overly of egg and perfect paired with a meaty, rich ragu (we had ours with a Bocca di Lupo recipe which calls for almost equal quantities of butter and pigeon and tastes more delicious than you can even begin to imagine). Twenty years or so on from that very first lesson, my pasta making has become a little more industrialized, the sound of turning metal plates replacing the methodic rolling of a wooden pin, but the results are pretty much the same: delicious homemade pasta, light and toothsome, soft and silky and as much of a pleasure to make as to eat. Next time you pass the fresh pasta aisle, please keep on walking, put a few pennies towards a pasta machine and have a go at making it yourself. I promise it’s absolutely worth the effort. This recipe requires a pasta machine. If you don’t have one and plan to roll by hand, I recommend a large rolling pin, even larger work surface and a lot of patience! I used a stand mixer fitted with the dough hook but you can also make this dough by hand. 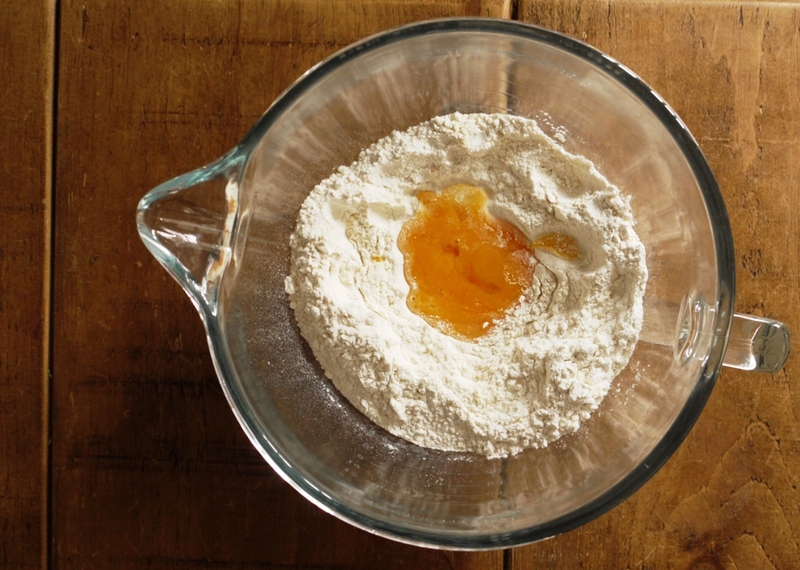 Put both flours into the bowl of your stand mixer, make a well in the middle and add all the eggs and yolks. Knead on a low speed for about 30 seconds until a crumbly dough is formed, then remove from the mixer and knead on a clean work surface until the dough is smooth and silky (about 5 minutes). Wrap tightly in cling film and pop in the fridge for one hour to allow the gluten to relax. Remove your dough from the fridge and divide into four roughly equal portions. Store three portions under a damp tea towel until needed (this will stop the dough drying out). Beautiful looking pasta, I always wished I could be Italian! Oh well, I’ll settle for the pasta. What a fantastic post…I am keen to try. It looks beautiful…..wish you had done a video podcast too (any thoughts of doing these) would love a home tutorial. It is lovely to read about you baking history too, I didn’t realise you had been cooking for sooooo long. Anyway, I always get confused with semolina and pasta flour, could you tell me which flours you used and where I could obtain them please? Ps Are you going to move into the food world professionally/are you there at the moment? You are wasted on a blog you have so much talent! Perfect food for this weather! There is definitely some pasta I prefer dried rather than fresh, but you tend to have to pay through the roof for the good stuff for what is such an economical thing to make yourself. Yours looks lovely and I love the way the sauce is just clinging to it, I can imagine the pasta just sucked it all up..luscious! This looks wonderful. Haven’t made pasta for ages (last time I ended up with ravioli laid over every surface of the kitchen – it was tasty, if messy in the making! Keep meaning to make some with my daughter on a wintry weekend afternoon. It has to be tagliatelle now, and soon! Claire – thank you! I’m pleased with how the pasta turned out but you should have seen the state of the kitchen floor – massive mess! Milli – that sauce is absolutely divine – if you have the Bocca di Lupo cookbook, make it! Sally – thank you for your lovely comment and tweet. What a lovely Christmas present. Perhaps a pasta maker should be on my Christmas list this year. Your pasta looks delicious–from the wonderfully styled photos to the simple phone photo. gorgeous photos! I’m going to have to add a pasta machine to my birthday wishlist! Oh yes, your tagliatelle are perfect and tempting! And I always buy ready-made pasta either and the supermarket (not very good) or at the Italian shop (better) and have been berating myself for not making it myself. I may just try your way. I’ve had a pasta machine in my cupboard for the last 4 years and have never used it. No excuse now – I’m going to have to give it a go. Beautiful pasta. I’m definitely with you about the things that are worth taking shortcuts for, and those that are most definitely not (ew store-bought hummus). I would put pasta in the the latter category, though, mainly because I don’t think I’m skilled enough to make better pasta than the good store bought kind. My sister and I have attempted it a couple of times, and while it tastes good, it’s never quite there. I’m resolved to fix that though. Next time I make a big batch of macarons or something similar, I’ll save the egg yolks for this recipe. What a lovely lovely post-I loved in particular your description of learning to make pasta at the age of 7! I love your homemade pasta – it looks so beautiful and you’re right, it is so utterly different to the so-called ‘fresh’ pasta that you can buy in the shops. I bet it tastes wonderfully rich with all those eggs in there too. Erin – it’s so worth it – I’ve been waiting for mine ever since I got my hands on a Kitchen Aid mixer! Kirsten – ah, thank you. I wasn’t sure whether to put the iPhone picture up but I loved the dish so much that I decided I had to! Amy – I wonder why that is… Maybe the recipe you were using wasn’t quite right. I’d recommend persevering as this pasta was divine! Kathryn – it was rich but wonderfully light at the same time – surprising with all those yolks. Wow, what perfect pasta! I need to dig out my pasta maker and cross my fingers that it’s half as lovely as yours!!! Oh god I need to have a go at this! What a great idea and a nice challenge for the coming year 🙂 also suggestions to freeze solve my cooking for one issues. nice post! That looks so good – my stomach is grumbling. I went to a pasta making course before Christmas (my first cooking lesson ever) and am now coveting the pasta making kit for my Kitchen Aid. Aha! Sounds like you have the pasta machine attachment for your Kitchen Aid too. I love mine and get lots of use out of it. I haven’t made such a rich dough yet with so many egg yolks but will give yours a go. Have you made ravioli / tortellini yet? Great fun to do as a couple! I just got a pasta maker too! -ok ok it was not THAT recent, try 6 months ago and I haven’t opened it yet.. I am a bit afraid of it. That Skinny Chick – you’re too sweet! Victoria – yes! Freeze in individual portions and you’ve got supper in seconds. Nuts About Food – it’s a great attachment, definitely recommend it. Amy – not yet, but they’re next on the list! Can’t wait! Your tagliatelle looks absolutely perfect! I haven’t made pasta in a while. Like you I have a distinct lack of bench space, and well, my pasta looked decidedly more rustic than yours 😀 I really should drag my pasta maker out again. You’ve inspired me! I love making pasta from scratch. You make it look effortless and inspire me to pull out my pasta roller! Beautiful. You’re right, rolling pasta by hand is a labor of love. Watching someone who really knows what they’re doing is amazing. I have a long way to go. You made me laugh with the description of store bought pesto – it’s truly awful. And why? It’s so easy to make. When I finally got a pasta machine, I felt a little guilty. But for me machine means more pasta and that, as you know, is a beautiful thing. Lovely looking noodles! Yesterday I went looking for my pasta machine that I haven´t used in years, after watching j.oliver make some. 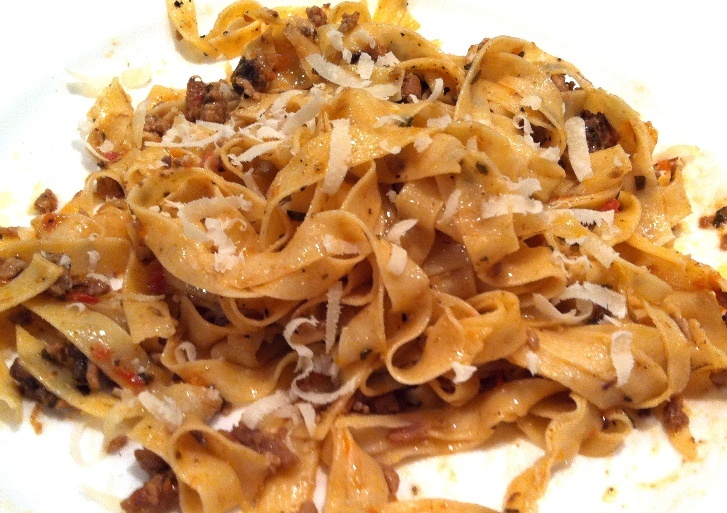 You´re tempting me with those amazing tagliatelle! I only tried making it by hand once, and it was enough to go buy a pasta machine…! Marissa – store bought pesto is seriously awful, and expensive. So much nicer to make yourself. Sacha – thank you, sometimes you have to prioritise and for me a pasta machine is a great time saver. 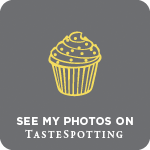 Paula – Jamie makes Italian food look so enticing, I’m not surprised! Yesss I love homemade tagliatelle. I once made it to go with some bolognese sauce that I made from scratch, the Italian way (using milk), and the final result was just incredible. Dried pasta is great, but sometimes it’s lovely to try the fresh stuff – this makes me want to dust off my pasta machine and have a go, particularly as it’s actually pretty easy, compared to making ravioli from scratch! Looks lovely. It certainly does contain a lot of egg! I’ve also not added semolina before, just used Tipo 00. Must give that a go. Your photography is very beautiful! Elly – homemade egg pasta is the best when it comes to rich, meaty sauces. I need to try ravioli next! Things We Make – I think a mixture of semolina and ’00’ gives the pasta a really lovely texture. Mrs Deer – thank you so much! 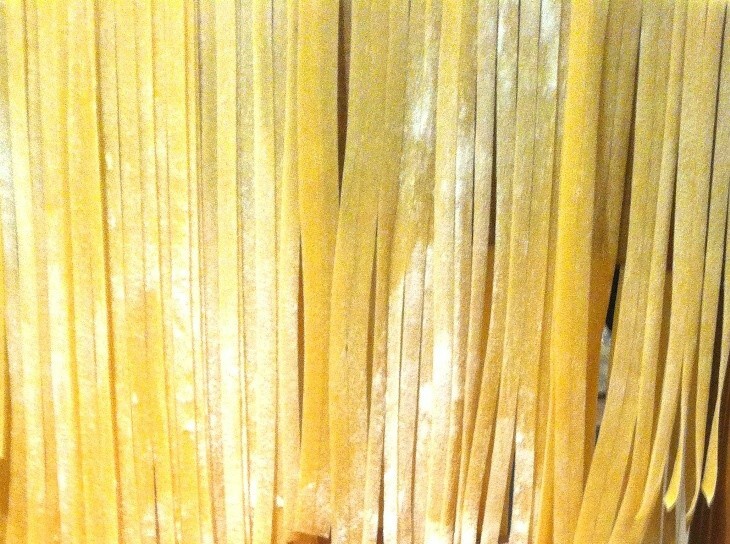 Fresh pasta is best eaten within 24 hours really. I hang mine over the back of a chair to dry but I think you can also roll into individual portions dusted with a little flour and store in the fridge. Hope that helps!